It’s important to have quality and proper Arizona Contractors Insurance, and necessary, in many cases, as well as helpful in gaining clients as they respect and feel safer and more comfortable working with contractors who are covered in the event of an accident that may cause injury or property damages. As a contractor you will want to protect yourself, and obtaining insurance that suits your needs and that of your company’s is essential. Contracting as a company and as an individual can be a risky business, as any time you combine manpower, equipment operation, and complicated construction structures, chances are that an accident or injury can occur, even if you consistently follow proper safety techniques. It’s detrimental to protecting the livelihood of your business, as well as your family and your assets from lawsuits from the liability of not having the proper Contractors Insurance coverage, as well as to keep from having to pay any costly expenses out of pocket. You can obtain necessary and affordable coverage including Scottsdale Contractors Liability Insurance with more detailed coverages with Installation Floaters as well as Builders Risk insurance policies and customizable Contractors Insurance policies for small and large companies to provide you with coverage to be protected in the event of an accident or injury while on the job as a contractor. Obtaining the necessary coverage and specific policy for you can be done through PJO Brokerage at an affordable and competitive price. We can give estimates for policies as well as customize policies to find one that fit your unique needs, to ensure you the best Contractors Insurance in the Phoenix and Scottsdale area! 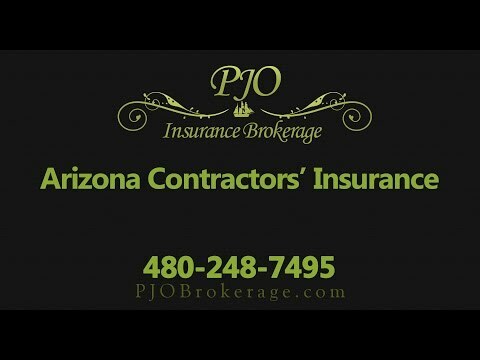 Give PJO Brokerage a call today and see how we can help you obtain the specific Contractors Insurance policy for you, to protect your livelihood, your finances, your company and your assets! This type of insurance is ideal for those who provide contracting services to other businesses and individuals. There are some firms that require contractors to have an insurance to work on their projects. Any contractor, whether a General Contractor or an artisan subcontractor, needs to be insured against accidents that can happen when doing a construction project. You will need insurance specific to your line of work. Whether you are an electrician, mason, plumber, framer, roofer, or a tiling specialist, you can be working with machinery and equipment, and even with safety standards and precautions in place, situations can occur where a property is damaged inadvertently on the jobsite, so coverage needs to be in place. Contractor Insurance is vital in any construction business, no matter the specialty.